"Čavka has been transformed both inside and out," says Sales Representative Katarina Bošnjak. "The centre had a very strong reputation by its old name, which was a well-known and trusted local brand. It sends a key message that we changed the name and used prominent signage to show that we are now part of the Affidea family." 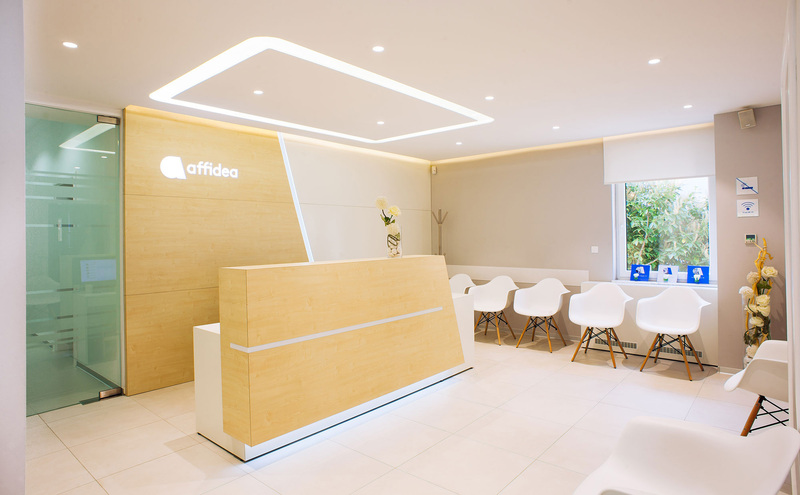 As yet co-branded, utilising the flexibility of the brand to combine old identities with new, the Affidea name, logo and colours are already dominant in the new centre design concept. Inside follows the guidelines being piloted, showing the smart new design, which will become another hallmark of the Affidea group. The centre layout has also been optimised, adding an extra changing room to the MRI unit, which will allow for a continuous flow of patients, as the changing rooms can be used simultaneously. The waiting area has also been expanded and more seating added for patient comfort and convenience. The screening area has been separated from the waiting area by a bespoke glass door to provide more discretion. Lastly, but perhaps most importantly, a brand new 64-slice GE Optima CT machine has been added, which staff at the centre were specially trained in operating.